Vodburner for Mac users is an application used to record both Skype video and audio calls. It is a kind of application that tends to create complex video productions directly from Skype. With this, you actually do not need to have Skype installed. Once you have downloaded Vodburner on your mac, you will only need to sign in through Skype account. If it’s your first time to use Skype application, you will notice that it will take longer to load. That isn’t a problem to get you worried as this application will be initializing all settings so as to have a list of the Skype contacts that you had before. This application is good because it enables you to record exactly what you see. The best thing also is that you can be able to control what appears on your video and what doesn’t appear. The video and audio calls are recorded in the MP4 and M4A formats which happen to be the best formats for recording. There is lots of flexibility as the end user is able to capture both sides of the calls while recording. You can be able to edit the video prior to publishing using the built in post-production console. You can trim portions of the call so that they do not appear in the final production. You can add texts captions, pictures as well as a background song. This is a very small application that installs without having any issues and it is neatly organized in the sense that when your chatting with your friends, you are able to multi task to other things as well. When capturing a call, the software solution displays the quality of the audio, and so you can be able to pause the quality of recording even if the call has not ended. This application does not support blocking of incoming calls. You cannot be able to do multiple video conferencing or connections at the same time unless you decide to put one video call on hold. Installing Vodburner is a simple task since you just have to follow the on-screen instructions. The best thing with the software is that it allows all Mac users record both sides of Skype conversation in either audio or video. Additionally, you have the freedom to save your recordings in either MP4, MOV, M4A etc. 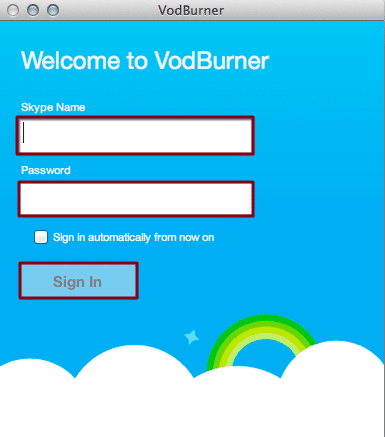 Vodburner is a stand-alone application and you have to login with your Skype details. It will initialize to get ready for recording. To retrieve your Skype contacts, you will have to hover over your contacts to see if your recipient is online. You will have to click the green camera icon located on the right-hand of your App window. Once the person you were calling accepts your call, you can start to record the call in either audio or video. To begin the recording, click the circular record button and you are good to go. 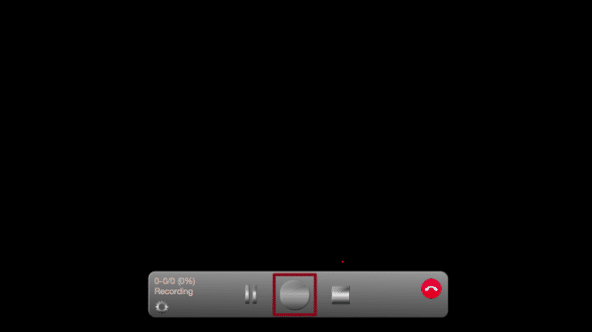 After you are through with the recording, you can stop the call by clicking the red phone icon. Now that you are through with your call recording, name it and save it to your preferred location. The main Vodburner window will give you access to it. Vodburner is that type of application that will allow you to be more productive in terms of recording Skype audio and video calls. It has the best easy to use interface as well as being able to share remote desktops and windows. You can also be able to use and record multiple methods of communications such as text and video.